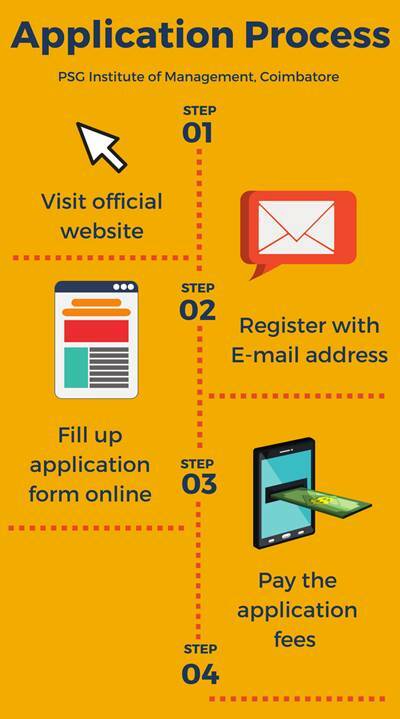 The students can apply online through the official website for PSG Institute of Management, Coimbatore admissions 2019. 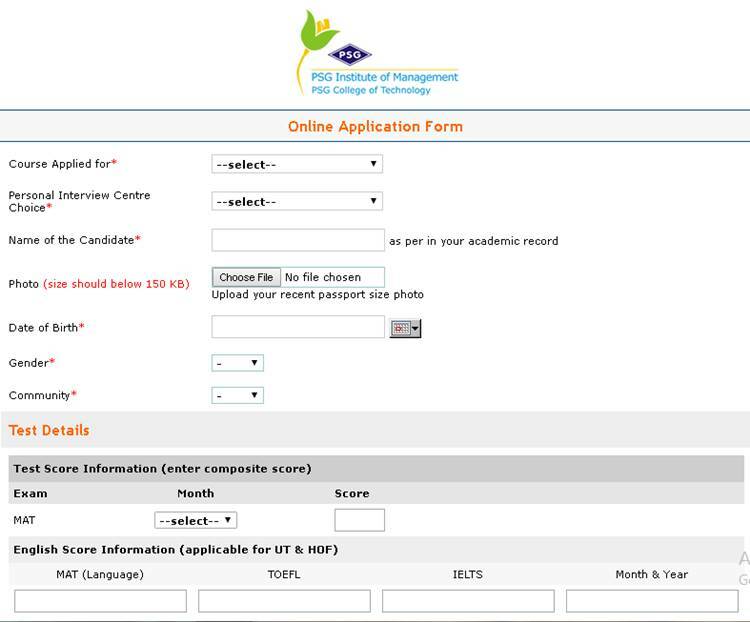 Click on "Apply now" option on the admissions page and read the terms and conditions and click on "continue". After entering your E-mail click on the "continue" button and fill up the application form. After applying online the candidate will receive an email with their login details as confirmation of application. The interview date will be given in the same email. Candidates applying for Anna University MBA Programme and PGDM Programme shall draw a Demand Draft (D.D.) for Rs.1000 (non-refundable) in favor of THE PRINCIPAL, PSG COLLEGE OF TECHNOLOGY, payable at Coimbatore. Candidates applying for University of Toledo and Hof University MBA Programme shall draw a Demand Draft (D.D.) for Rs.1000 (non-refundable) in favor of PSG INSTITUTE OF ADVANCED STUDIES, payable at Coimbatore. All applications must reach the college office before the stipulated deadline. Candidates can have to pass the Education Eligibility criteria i.e. must have a two-year work experience and have 50% aggregate marks in Bachelor's degree. 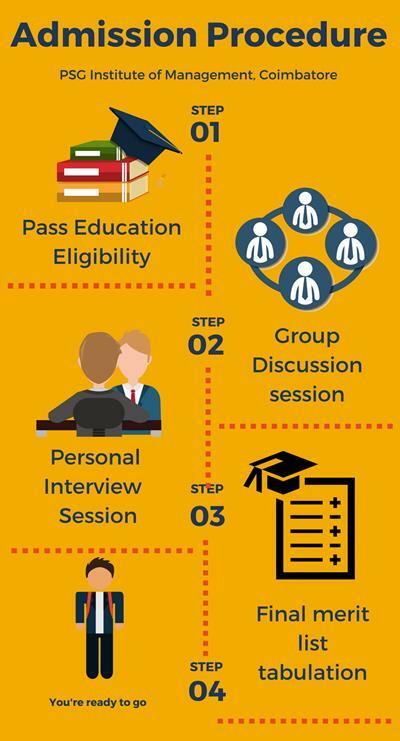 Eligible candidates are then called for a Group Discussion and Personal Interview [GDPI] session where the candidates' aptitude, spontaneity and responsiveness is put to the test. A final merit list is prepared based on both counseling sessions. Those whose names appear in the final merit list are considered for PSG Institute of Management, Coimbatore admission 2019. Selected candidates are then expected to pay the admission fees and enroll themselves in the degree course. Candidates are required to have a Bachelor’s degree or an equivalent qualification in any discipline with at least of 50% marks and either a valid MAT Score or a valid CAT score for PSG College of Management, Coimbatore admissions 2019. Preference is given to the candidates with a minimum of 2 years work experience and a recognized Bachelors degree in any discipline with at least 50% marks in aggregate. Selection is based on MAT/ CAT/ ATMA/ TANCET 2019 scores. Candidates who have completed 10+2 are eligible to apply to PSG Institute of Management, Coimbatore for this course. A recognized bachelor’s or equivalent degree in any program with a minimum of 55 % in aggregate is required to apply for the MBA program. For PGDM and MBA (Part Time), preferably a minimum of 2 years work experience is desirable. A recognized bachelor’s or equivalent degree in any program with a minimum of 55 % in aggregate is required. What is the eligibility criteria for MBA(finance) in PSG Institute of Management, [PSGIM] Coimbatore ? A recognized Bachelors degree in any discipline with minimum 50% marks in aggregate. What is the Fee Structure of PSG Institute of Management, Coimbatore for MBA courses? What is the Admission and Selection Process of PSG Institute of Management, Coimbatore for Management Program?